It Did Exactly What It Said On The Tin ! 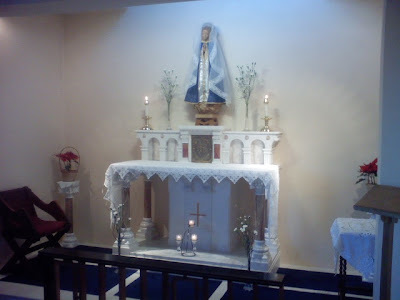 First of all, we have a cape and veil for the statue of Our Lady which had its first outing today... just so you can see the statue in situ, here is the Lady Altar with the statue in the new cape and veil. 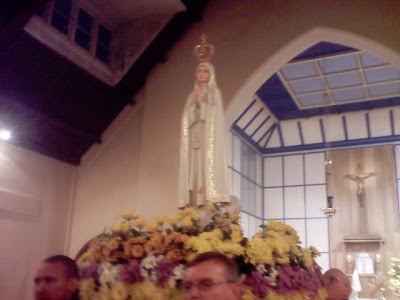 The Day With Mary started with an entrance procession, and the crowning of the statue of Our Lady of Fatima. 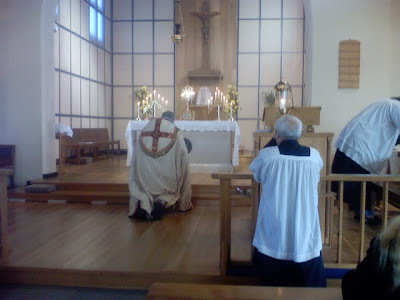 The Mass was Novus Ordo, but ad orientem and in Latin (which gave me a chance to practice a few of the prayers I've been learning!) 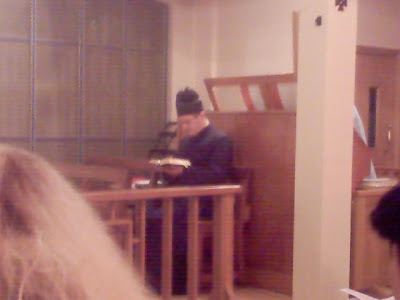 Fr Tim preached on the options facing us after we die... Heaven (via Purgatory) or Hell. Something of a no-brainer, but most people act as if there is nothing more than the here and now. We were given a teensy reminder that we are not absolutely sure of our eternal salvation. Hell is still a possibility. Cheerful chap, our PP ! At the end of Mass, it being the Feast of St Blaise, we had the blessing of throats. Here you can see Father blessing the candles. 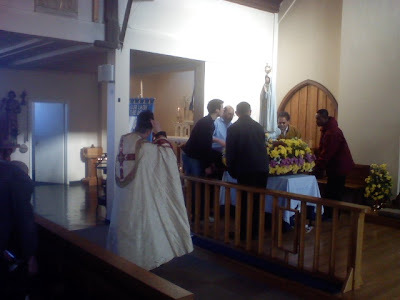 There were three priests doing the blessings as there were rather a lot of people at Mass! 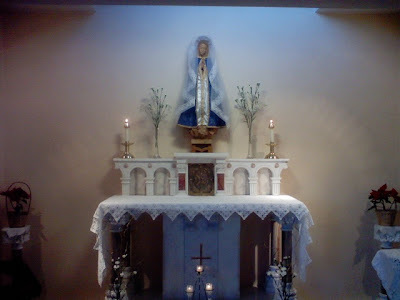 We had Exposition and then the Blessed Sacrament procession (round the block again) and then the Rosary and a sermon on Our Lady by Fr George Roth (one of the Fransiscan Friars of the Immaculate) He's great, though his broad American accent takes a bit of getting used to! 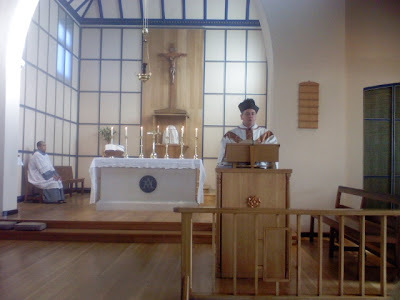 After a break for tea, we had Stations of the Cross (done as a meditation and prayers... there were too many people to have a procession round the stations) another sermon on Our Lady (delivered by Fr Tim... very moving, I hope he posts it on his blog!) 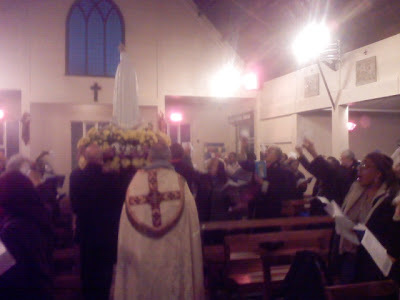 a final Rosary, and Benediction. 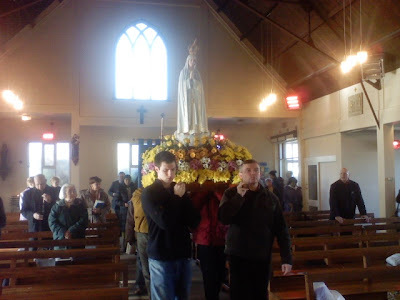 Finally, the statue was carried out of the church, and we all waved goodbye with white hankies (a tradition started in Fatima) while singing a farewell hymn. The day was really wonderful. With the large number of people going to Confession I'm sure that several Holy Souls were sprung from Purgatory. Ambrose was also a writer of liturgical hymns. Given his stance against the Arians, he would probably approve of my position on dodgy and heretical hymns, which must be why he picked me! Of course, the most famous tale told about St. Ambrose is that he was Governor of Milan when two opposing factions were fighting over who should be their next Bishop. The legend tells how a young child cried out "Ambrose bishop!" and this was enthusiastically taken up by the surrounding crowds... Ambrose wasn't too keen, and promptly did a runner. On being persuaded to return, he pointed out that he wasn't even baptised, being only a catechumen. 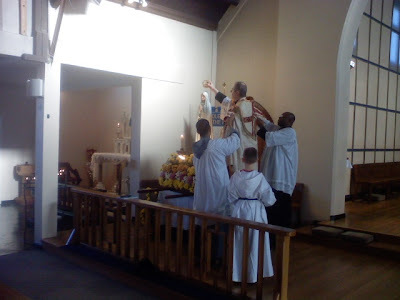 So he was baptised, ordained priest and consecrated Bishop within the space of a week. You can read more HERE and check out some of his writings. Many, many thanks to Moneybags for doing this - there are an awful lot of Bloggers who want to be picked by their own personal saint, so the work involved is phenomenal!! 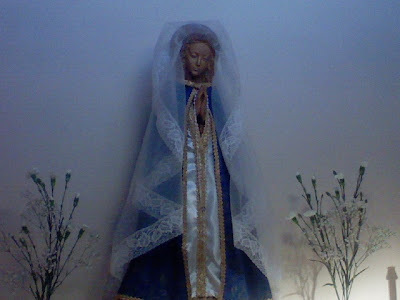 If you didn't spot my previous post on being picked by a Patron Saint, then pop on over to A Catholic Life and post a comment asking to have a saint allocated. 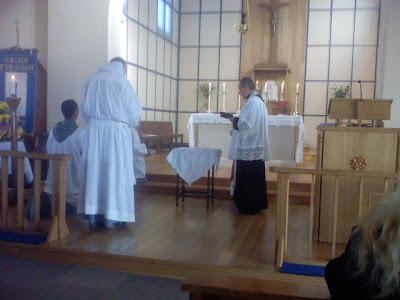 Especially for Fr Tim at the Hermeneutic of Continuity: the Sequence for Candlemas, which is (according to Fr Jim Tucker of Dappled Things) now preserved only in the Dominican Rite. Yes, well, the Carthusians probably have a version too, but they don't appear to blog! Aha! I knew that it would be too much to resist... my 10,000th visitor has identified herself as none other than Autumn Rose. Hoteliers chasing the pink tourist pound have joined criticism of a law outlawing discrimination against homosexuals. The hotels, which cater for the thriving “exclusively gay” tourism market, say that they should be exempt from the Sexual Orientation Regulations as they will be forced to accept heterosexual guests. Some say that a ban on “gay only” advertising could put them out of business. There were also concerns that some heterosexual couples might be unhappy if they unwittingly booked into a gay hotel. H/T to the Dúnadan for highlighting this one! You can read the full article HERE. Ha! I Am a Genius! I was somewhat worried when, after my little flirtation with Haloscan, my comboxes came up with error messages. 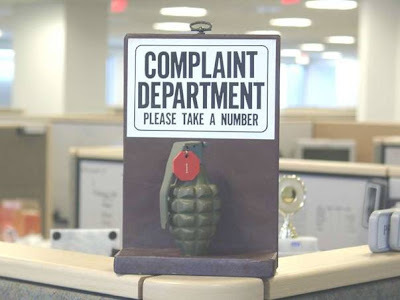 And then, having noticed that nearly everyone else had the same problem, I relaxed. ...so this morning, when the problems on other blogs appeared to have been sorted but mine was still showing errors, I started to worry again. Ah, the past! You may not remember it well - because you're still living in it. While you've changed some, you may want to update your wardrobe, music collection and circle of friends. I was playing around with my blog this evening, and decided to look into switching to Haloscan for my comments boxes. — "I died while waiting for a cure to be found by research on embryonic stem cells, and you?" 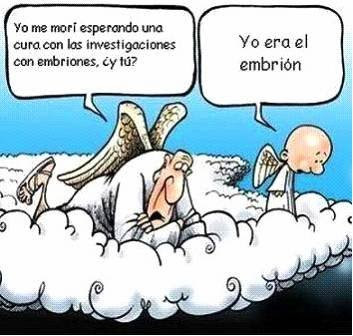 — "I was that embryo!" 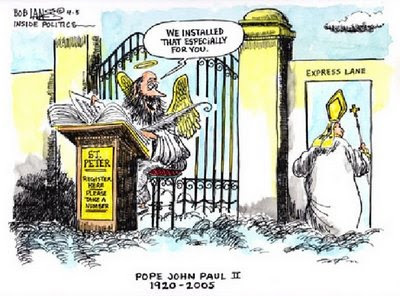 H/T to the American Papist. In the Comments section of my post about my purchase of a Douay-Rheims Bible, Mark wanted to know how it read. I already said that the font was clear and a decent size, and each verse started on a new line. But, just in case anyone else was interested, I thought I'd supply the snippets Mark was interested in... I haven't started each verse on a new line, but I have kept the emphasis and punctuation. "Charity is patient, is kind: charity envieth not, dealeth not perversely; is not puffed up; is not ambitious, seeketh not her own, is not provoked to anger, thinketh no evil; rejoiceth not in iniquity, but rejoiceth with the truth;"
"Deliver me, O Lord, from the evil man: rescue me from the unjust man. Who have devised iniquities in their hearts: all the day long they designed battles. They have sharpened their tongues like a serpent: the venom of asps is under their lips." "Now thou dost dismiss thy servant, O Lord, according to thy word in peace; Because my eyes have seen thy salvation, which thou hast prepared before the face of all peoples: a light to the revelation of the Gentiles, and the glory of thy people Israel." 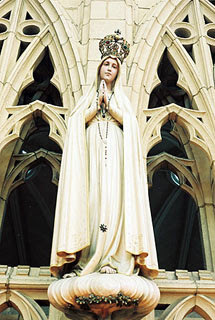 "And Simeon blessed them, and said to Mary his mother: Behold this child is set for the fall, and for the resurrection of many in Israel, and for a sign which shall be contradicted;"
"Christ came for the salvation of all men; but here Simeon prophesies what would come to pass, that many through their own wilful blindness and obstinacy would not believe in Christ, nor receive his doctrine, which therefore would be ruin to them: but to others a resurrection, by their believing in him, and obeying his commandments." 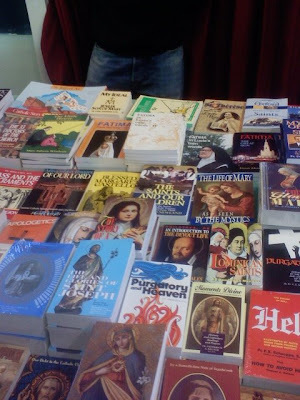 Andrew over at Unam Sanctam has been reading the new book by JPII's Secretary, and it reminded him of the death of the Holy Father and what he was doing when he heard about it. He's posted some pretty moving photos to help jog our memories, and has invited everyone to share their memories in the combox. 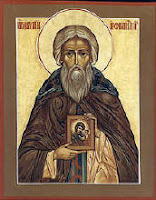 Moneybags over at A Catholic Life has a lovely post: pick a patron saint (or rather, let the saint pick you) for 2007. Saints are being allocated at random. St Faustina did this in her convent, so you'll be following in her footsteps. I'll let you know who I get as soon as I find out... oooh, it's like Christmas all over again! Having been seriously hacked off by the revelation that the various modern translations of the Bible haven't just updated the English but have severely mangled the meanings in the process, I decided to get myself a copy of the Douay-Rheims Bible. If you missed my anguished cries on the subject, you can read them again HERE. I was informed that this was the original English translation of the Vulgate, and as such would give the meanings of the Scriptural texts as understood by my favourite Saints. 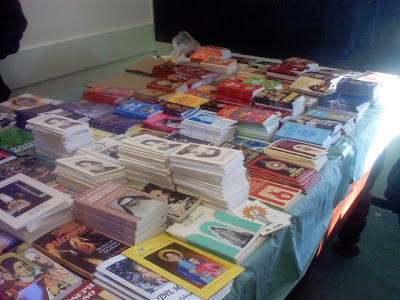 I finally plumped for a Bible published by TAN (usually a safe bet on the orthodoxy front), encouraged by the fact that it was supplied by a bookseller in the UK... and once I decide I want a book, I really want that book, like yesterday... or sooner. It arrived today (one of my neighbours kindly accepted it from the postman in my absence.) I am not really enamoured of the cover (shiny black card - standard paperback thickness) and I have doubts about the staying power of the binding, but the text is in a good size font, and each verse is on a new line, so it's great for checking references. The Douay-Rheims Bible is the only traditional Catholic Bible in the English language. The Douay-Rheims Bible was the only Catholic English translation of Scripture commonly in use for over 200 years. We maintain this is the best, safest, and most accurate translation of the Bible in English. The Douay-Rheims Bible is so packed with meaning that a single phrase can yield profound insight - because it was translated with great respect for every word. 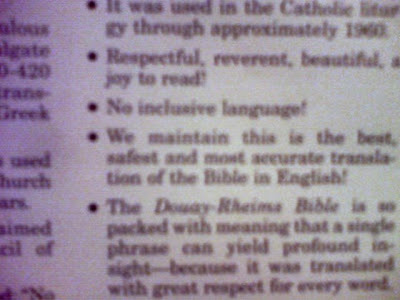 The footnotes in the Douay-Rheims Bible are totally Catholic and are definitely not the opinions of modern biblical scholars. The 2007 Catholic Blog Awards are coming around... Nominations will be taken from Sunday, February 4th to Friday, February 9th. Voting will be during the week of February 12th to 16th. H/T to Happy Catholic for the categories.